Clix Heating Torch 360 Degree With Reflector – Infinity HVAC Spares & Tools Pvt. Ltd.
Intense, effective & wind stable flame that reaches around the pipe. Soft soldering of pipe upto Dia 40mm. Brazing of pipe upto Dia 18mm. Powerful flame with adjustable temperature upto 1925° C.
360° rotation for M*14 & threaded cartridge connection. 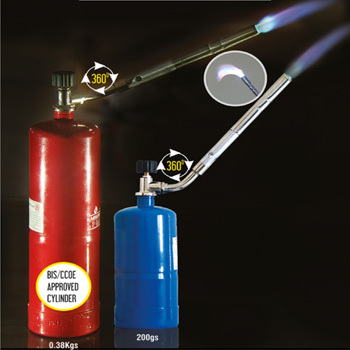 For LP gas butane & propane/ butane mix of 50/50. Stainless steel deflector for fast brazing & energy saving.